The last few years I have grown accustom to using open source software. Lately, I have been thinking that I would like to give back in someway to the open source community. While financially I can't really afford to donate money to something such as the gnu project, I could donate some of my time and work on an open source project. I'm not really sure what is the best way to go about getting involved in an open source project. Should I go to a site such as freshmeat.net and try to find an interesting project and email the authors of the software to see if they need help? Are there any other sites I should use to locate potential open source projects to work on? I basically would like to know where is a good starting point for get involved in a project and see if anyone has any recommendations. I am fairly inexperienced with working on large projects. I have experience programming in Java, C, and C++ but only in a academic environment. I'm always trying to learn new things about programming and I think the experience of working on a project would benefit both me and the users of the software. If any body has any suggestions let me know I highly appreciate it. Anyone who has tried to install software on a Linux system knows how difficult it can be. The problem that comes up most often is failed dependencies. I encountered this problem numerous times. I would usually install new software by using rpms or compiling with make which often fails because libraries are missing that are needed by the new software. I even encountered this problem when using the package managers that come with the various distribution. I heard about yum a while back but never tried it. A few days ago I came across a yum tutorial. What a difference yum makes when installing and upgrading packages. Instead of the user having to look for missing libraries that are needed to install a new package, yum takes care of this problem for the user. I was very impressed with how well yum works and would recommend it to others. A few weeks ago I read the book "The Art of UNIX Programming" by Eric S. Raymond. I would I highly recommend this book to any one who has not read it. 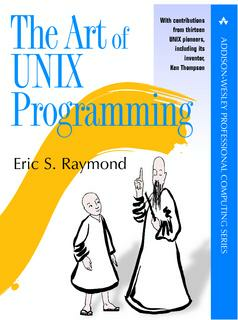 In Raymond’s book, he basically describes the philosophy used to create programs for the UNIX environment. I originally starting using UNIX a few years back in an Operating System class I was taking in college. At first I didn't really like to use UNIX. I would have a hard time remembering the commands and always forget the common options that were available for the commands. During the class I installed I copy of Linux on my home PC to play around with. At first, I basically used Linux a small percentage of the time. Most of the time I would use Windows because I was familiar with the programs. Not that anything I doing on Windows I couldn't do on Linux I was just unfamiliar with how to go about completing the tasks. Over time though, I have become less reliant in using Windows. On my PC, I would boot into multiple OS's such as Windows, FreeBSD and Linux. I finally got to the point a few weeks ago where I removed Windows altogether from my computer. Hopefully this situation will continue, but it is highly unlikely. While I don't have the need to use Windows, I'm sure that in the future I will find a job where I will have to use Windows again. On the topic of the book that I mentioned earlier, Raymond describes the difference in the users of UNIX as compared to Windows. Raymond describes a UNIX user as someone who is typically an engineer or a scientist and wants the programs that are powerful and flexible. While a typical Windows user is basically not very intelligent and would rather sacrifice flexibility and power for ease of use. I think he fairly sums up the difference in the users of the two systems. The one thing I notice a lot that bothers me is when people say they are experience computer users. I think everyone on resume puts that they have computer experience. Today who isn't proficient with a word processor or in creating presentation? Is that some kind of unwritten law that when a person creates a resume they state they are proficient using Microsoft word. This summer I'm going to also try to read Raymond’s book the Cathedral and the Bazaar. I know it is kind of old now but it seems like it would be another interesting book. I read a few of the other books on open source by O'reilly. Well it has been awhile since I posted anything on my weblog. I originally said I would try to make a post at least once a week and that failed to happen for a while. I was busy with school and now I off for the summer, so I should have some more time to actively post. It is kind of nice to be almost done with school, all I have left is to complete either a thesis or project to get my masters degree. The problem I'm having is what to the project on. I'm thinking of either trying to work on an open source project or else something in the field of either distributed systems or security.